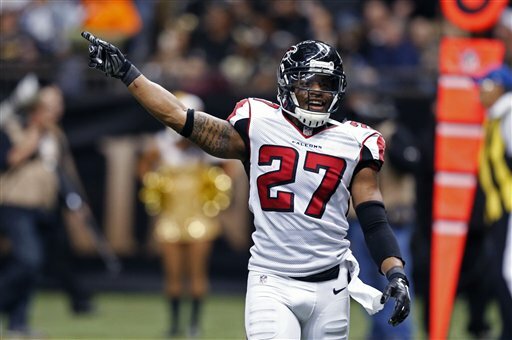 Osi Umenyiora trotted 86 yards for a touchdown off a fumble return as time ran out to bring out the caskets for the Saints as the Falcons kept their postseason hopes alive with a 30-14 dominating performance. With the win, the Falcons improve to 5-0 in the division and 6-9 overall. The loss eliminates the Saints from playoff contention. It’s the first time Atlanta has swept New Orleans since 2005, and it’s only their second victory in the Mercedes-Benz Superdome since Week 3 of the 2010 season. If you used this game as a barometer to determine what kind of defense the Falcons had, you would’ve never guessed they ranked as the league’s worst. Or that the Saints offense ranked second in the league. Atlanta had just 16 sacks heading into the game, but the unit terrorized Drew Brees all afternoon, ending the game with a five-sack showing. The Falcons defense also generated four turnovers: two interceptions and two fumble recoveries. Jalen Saunders took the game’s opening kickoff 99 yards, setting up an easy one-yard touchdown run for Mark Ingram on the very next play. And just like that, the Saints went ahead by seven just 20 ticks into the game. But it was all Atlanta after that. The Falcons held a 13-7 lead at the half, allowing just 78 total yards while gaining 223. New Orleans didn’t score again until late in the fourth quarter on a four-yard touchdown reception by Jimmy Graham, making it a 20-13 game. The Saints had their opportunities, but a stout Falcons defense denied them on two key occasions. On one, Brees completed a pass to Graham on what could have been a 14-yard touchdown, but Atlanta’s Kemal Ishmael ripped the ball before the tight end could get across the plane. On the other, the Saints had a chance to drive down the field with 2:35 left in the game and take the lead down 20-14. But on the drive’s second play, Brees was picked off by Robert McClain. Three run plays later, Matt Bryant kicked a 32-yard field goal to give the Falcons a 23-14 lead with two minutes remaining in the game. Julio Jones, who was a game-time decision with a hip injury, proved to be more than just a decoy as he caught seven passes for 107 yards. Matt Ryan didn’t put up the 443 yards he did in Week 1, but he quarterback was still sharp as he finished 30/40 for 322 yards and one touchdown and no turnovers. He also wasn’t sacked once. For the Saints, Brees threw for 313 yards, one touchdown, and two interceptions on 30 of 47 passing. The loss was New Orleans’ fifth consecutive at home this season. The NFC South is on the line next Sunday in a winner-take-all matchup as the Falcons host the 6-8-1 Carolina Panthers.